We have carved a niche amongst the most dominant names in this domain, engaged in offering Seedless Soap Nut Shell. We offer best quality Graded Seedless soapnut shells. (Washnuts, waschnüsse) that grows on trees in Himalayas used as Eco-Friendly washing detergent . What are soap shells These soap shells are harvested in South India from the 15 meters high soap tree (Sapindus trifoliatus). Its fruits are called soap nuts and contain saponin a natural an active cleaning agent that in contact with water will keep your laundry clean and fresh. Soapnut shells new crop and cleaned export quality. Soapnuts are used in Ayurvedic medicine as a treatment for eczema, psoriasis, and for removing freckles. Soapnuts have gentle insecticidal properties and are traditionally used for removing lice from the scalp. Soap nuts are also used as the base for nontoxic laundry detergents. 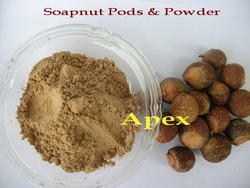 Our organization is among the leading traders of Soapnut Shell. The shells which we offer are prepared under most clean conditions and packed with high quality of packing material. Moreover, the range of Soapnut Shell which we offer is widely known for freshness and aroma. We have found a 100% natural cleaner which grows wild in the sanjeevani hills at Udayagiri, Nellore dist, Andhra pradesh and has been used for centuries in several areas of Andhra pradesh. It's on supermarket shelves and it's cheaper than our chemical alternatives. And it works. Really, really well. Being the well-distinguished companies in the market, we are into offering Soapnut Shell. We are engaged in offering a high quality range of Soap Nut Shell.